Advocates. Superheroes. Defenders. Challengers. Guardians. If you work in healthcare and healthcare IT, are these the words you use to describe yourself? This year at Healthcare Information and Management Systems Society (HIMSS) 2019, organizers are encouraging the champions of healthcare to unite, drawing on heroic imagery as the theme of the conference. Conference leaders make the case that, yes, healthcare technology can be disruptive, paradigm-busting and bewildering — but ask providers to look past all that and accept the mission of superheroes: “Advance the safety, efficiency and quality of care, outcomes, health, and well-being for us all.” So much is happening where healthcare and technology intersect that it will require champions and superheroes to chart the path forward. Disruption, change and innovation are topics for the conference keynote sessions. These are exciting times in healthcare, and HIMSS 2019 aims to unite the champions of health to navigate these emerging trends. Whether you are attending HIMSS in person or joining the conversation on social media, follow these five trends during this year’s conference. Perhaps no single group drives quality care like nursing staff. Nurses require the most up-to-date information to successfully manage patient care. They also play a critical role as conduit between patients and physicians. Mobile devices such as smartphones and tablets provide an ideal communications platform, but many hospitals are still relying on legacy technologies like pagers or comms badges. 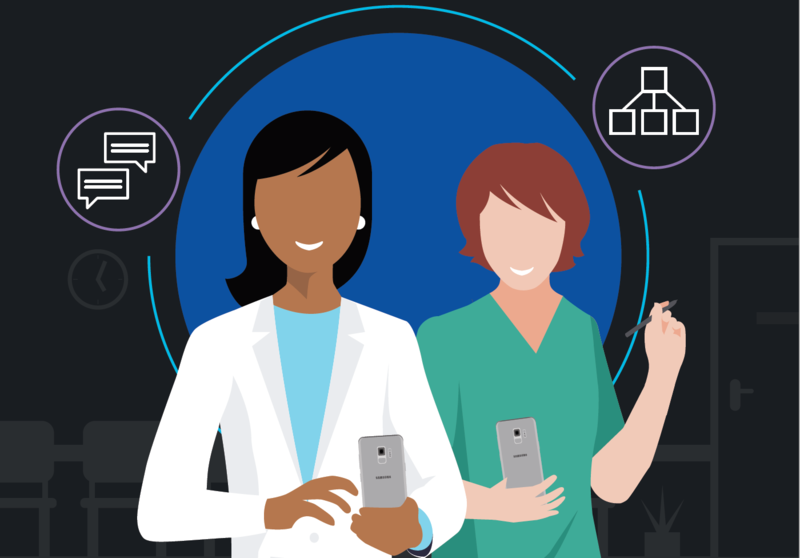 Smartphones and fully integrated clinical communications apps make the jobs of healthcare workers easier and result in higher quality care. Showcasing its solution at HIMSS, TigerConnect provides real-time communications software specifically for healthcare. The company’s platform provides a centralized solution to track patient status changes, expedite lab requests and results, speed up patient discharge and track the speed and logistics of therapies. In the U.S., one in four deaths is attributable to cardiac disease, according to the CDC. Once a patient presents with a cardiac condition, regular monitoring and physician visits become standard. To more closely monitor these patients, some healthcare providers turn to remote monitoring using mobile devices as one option to manage and treat heart disease. LIVMOR will be at HIMSS demonstrating their home-based patient care platform tailored to cardiac management. Using an automated smartwatch, the platform collects and transmits cardiac measurements and uploads them to the cloud, where healthcare providers can access the information. This system provides continuous monitoring from virtually any setting and provides sensitivity readings comparable to physician-administered electrocardiograms. Concussion, dementia, autism spectrum disorder, Parkinson’s disease … it’s difficult to objectively track these and other neurological conditions. Concussions raise particular concerns because the CDC reports that in 2017, 2.5 million students experienced at least one concussion in the prior 12 months. There has been no way to objectively determine when these students may safely return to play. Quadrant Biosciences wanted to change that. The company combined clinical best practices, cloud-based analytics and a Samsung tablet to develop an FDA-compliant solution: the ClearEdge Brain Health Toolkit. Patients use the tablet to complete cognitive testing, and wear a sensor that evaluates balance and feeds data back to the tablet. According to the National Foundation for the Blind, vision loss affects more than 25 million adult Americans. A number of innovative companies will be showcasing technology at HIMSS that helps enhance the lives of people with low vision. IrisVision has created an FDA registered Class-I medical device that works as a low vision aid. This tool pairs virtual reality technology from Samsung with software developed in collaboration with leading health experts. Another Samsung partner, Aira, offers a service that remotely connects blind and low-vision people with a professional agent via a smartphone app or their Horizon Smart Glasses paired with a Samsung Galaxy smartphone. Every year, increasingly sophisticated telehealth devices enter the market. Remotely tracking, gathering and analyzing patient data allows care teams to spot potential problems with patients earlier than they could previously. With information delivered remotely, healthcare providers can interact with patients to modify care plans and intervene to head off the need for a hospital readmission. Remote patient monitoring solutions from companies like Ideal Life simplify the way patients, doctors and caregivers track, monitor and manage health conditions. Patients can engage without touching a computer. Doctors and nurses only need access to a web browser to analyze and retrieve patient information. If you’re attending HIMSS, drop by the Samsung Lounge in Room #224 H to see these innovative solutions and take a break from the expo floor.